76 1933 The December meeting of the W.C.T.U. held at home of Mrs C. S. George. Meeting opened by group sing "Joy to the World", Carol " It came upon a Midnight clear" by Mrs Mitchell and Mrs Richards. Mrs W. J. Stewart had charge of the devotionals Scripture taken from II Chronicles Hebrew James, John and Romans. Subject of thought, "Prayer". Several prayers were offered. We were then favored by a duet "121st Psalm by Mrs A. McBlain, Mrs M. A. Stanley accompanied at the piano by Mrs Arthur Lane. Miss Butler took charge of the business meeting. Secretary's report of Nov. meeting read and approved Mrs Kearney gave report of nominating committee. Mrs Robt Lincoln would accept office of Treasurer with the provision that she might call on any of the members to help with the collection of dues. Report approved and adopted. 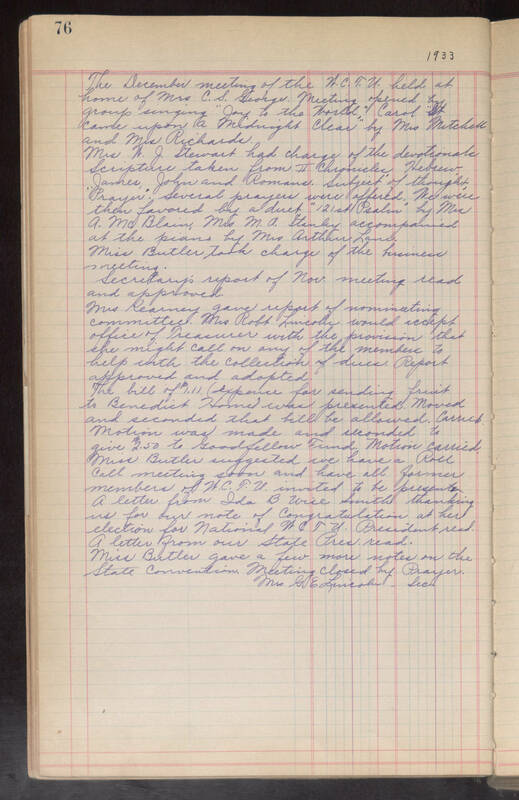 The bill of $1.11 (expense for sending fruit to Benedict Home) was presented. Moved and seconded that bill be allowed. Carried. Motion was made and recorded to give $2.50 to Goodfellow Fund. Motion carried. Miss Butler suggested we have a Roll Call meeting soon and have all former members of W.C.T.U. invited to be present. A letter from Ida B. Wise Smith thanking us for our note of congratulation at her election for National WCTU. President read. A letter from our State Pres. read. Miss Butler gave a few more notes on the State Convention. Meeting closed by Prayer. Mrs G E Lincoln-Sec.